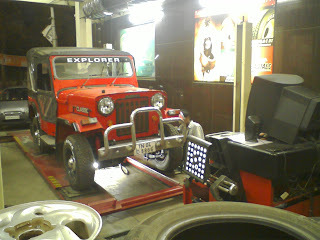 After a notable tyre depreciation mark, I have taken the jeep to the computer assisted 3D wheel alignment center. 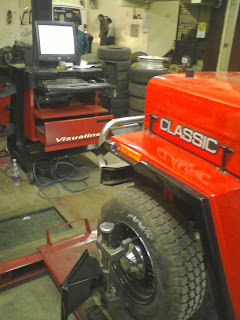 Though they could correct only the tow part of wheel alignment with strighting the steering wheel. 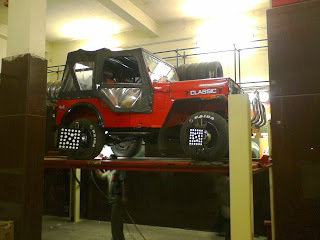 Got a chance to look at the underchase parts in my classic as the jeep was lifted with the power lift. Ofcourse, the wheel alignment finally corrected the tight steering wheel issue and now I can easily turn around with my jeep. Apart free turn of steering my next issue to address goes with the break as one of my jeep's wheel get jammed as and when I press the break pedal tightly causing skid over the road. Need to visit the garage to fix the issue as it invovles great risk with the break.